The first trailer for the new Star Wars movie Rogue One has been released. 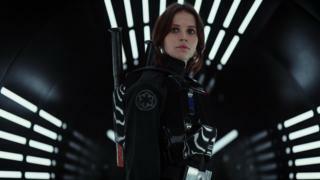 The one minute, 38 second teaser reveals new look stormtroopers and details about the lead character played by British actress Felicity Jones. At the beginning of the trailer, she states her name as Jyn Erso, and is described as "reckless, aggressive and undisciplined". Rogue One tells the story of a group of rebel fighters on a mission to steal the plans for the Death Star. The film, out in December, is the first in a series of on-screen adventures exploring stories outside the core Star Wars saga. After a montage of images of stormtroopers under attack, Jones's character states: "This is a rebellion, isn't it? I rebel." Erso is briefed on her mission, over images of the Death Star: "A major weapons test is imminent - we need to know what it is and how to destroy it." The film is directed by Briton Gareth Edwards, whose previous movies were Godzilla and Monsters. The cast also includes Mads Mikkelsen, Forest Whitaker and Riz Ahmed.